Chris Soules romantically proposed to Whitney Bischoff on ‘The Bachelor’ finale but are her feelings for him way stronger than his feelings for her?! A body language expert explained to HollywoodLife.com that it looks to be the case! 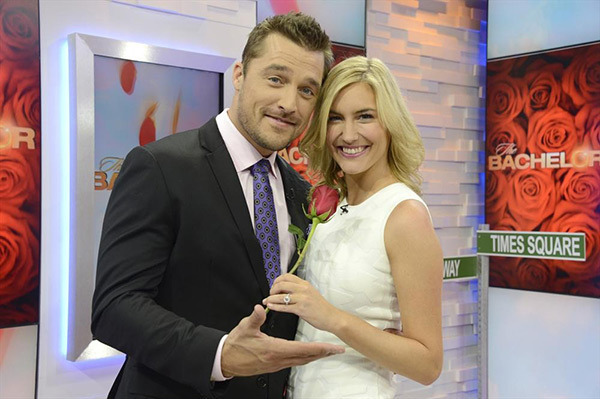 The newly engaged couple, Chris Soules and Whitney Bischoff, stopped by GMA on March 10 to show off their love, however, body language expert Dr. Lillian Glass was NOT convinced. She didn’t even believe his proposal was genuine — she explained his “lack of passion in his tones” made the whole thing “seem robotic and distanced”! “Based on her body language you can tell that Whitney adores Chris,” Dr. Glass told HollywoodLife.com about the couple on GMA. “In fact she adores him more than he adores her body language wise. She is the aggressor as she leans into him and takes charge of the kiss as you can see in the photo (you can view all photos in gallery above). In the candid photo where he is in back of her, he is leaning back a little which is distancing on his part. In the photo where they are posing outside of the studio, she leans into him and he has his hand in his pocket making you wonder if he has something to hide, like his true feelings for who he really fell in love with,” she explained. Dr. Glass also feels as if the relationship wont last long off the farm. “Also when he proposed to her, you didn’t feel the emotions coming from him that Whitney projected to him. he was monotone and mechanical. It seemed as though he was settling. Even though he said he loved her the monotone and lack of passion in his tones made it seem robotic and distanced. Do you think Whitney loves Chris more than he loves her? HollywoodLifers, do you think Whitney loves Chris more than he loves her? Let us know your thoughts in the comments below!